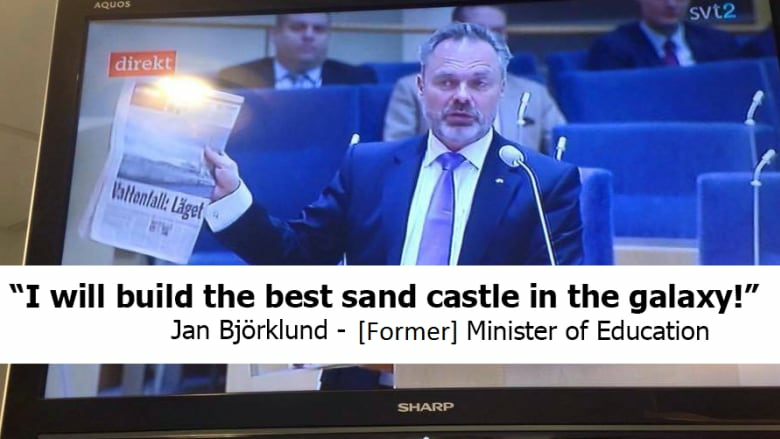 Parliamentary debates can be pretty boring, unless your elected leaders appear to be arguing about sand castles, dinosaurs, and submarine trains. 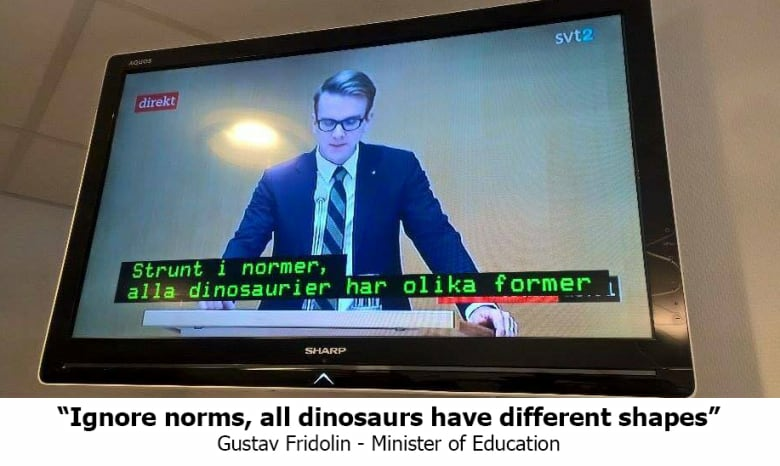 It's not every day you see a minister talking about dinosaur equality. 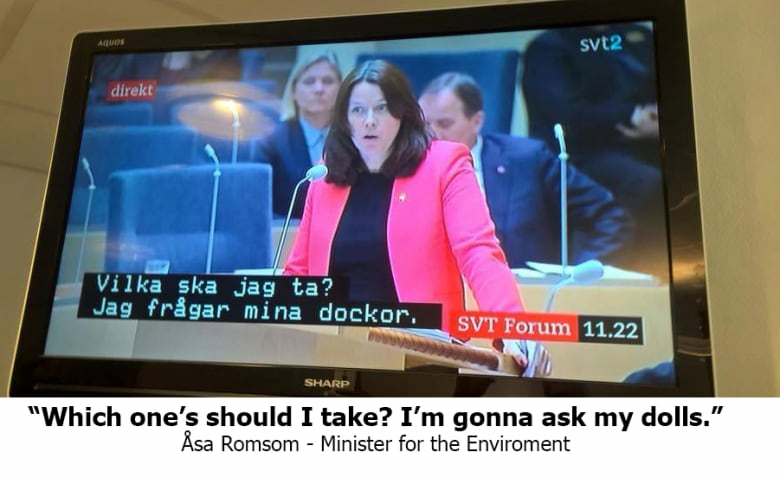 As seen above, last week the leader of Sweden's Liberal party seemed to make a surprising declaration. In reality, he didn't say any of what was captioned in the video. SVT2 was running the Swedish equivalent of CPAC, SVT Forum, which showcases debates in the Rikstag, the country's national legislature. 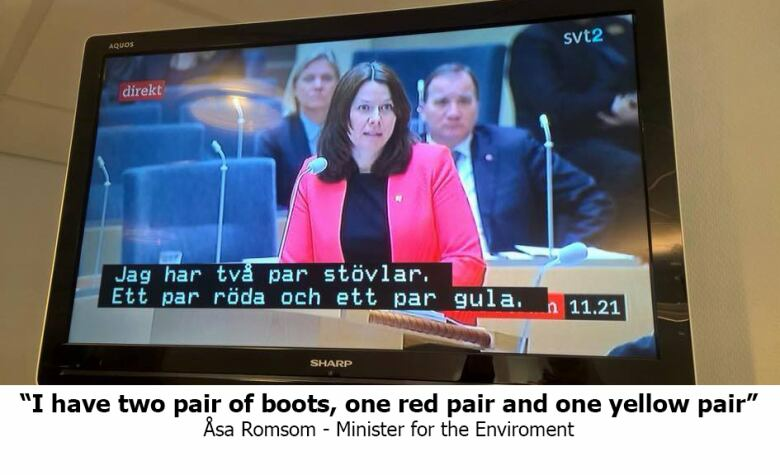 The closed captions for a children's show were switched with that of the debate on some TVs according to SVT, which says it did not intentionally switch the captions. Regardless of how it happened, the error resulted in the country's national leaders appearing to make bizarre statements on topics like dinosaur rights. 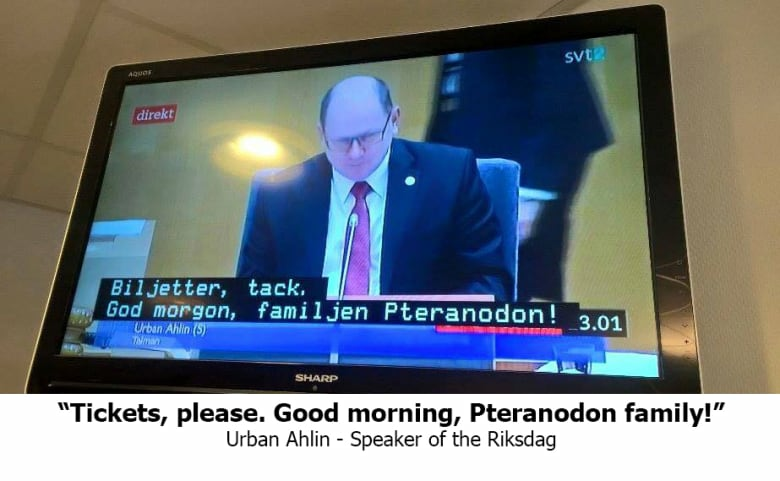 TheBlondeSwede, a user on the image sharing service Imgur, managed to capture the incongruous subtitles, and translate them. "This would make politics much more interesting!" he wrote in the post, and the comments almost universally agree with that. Some of the discussion wasn't that far away from the usual political discourse, however. 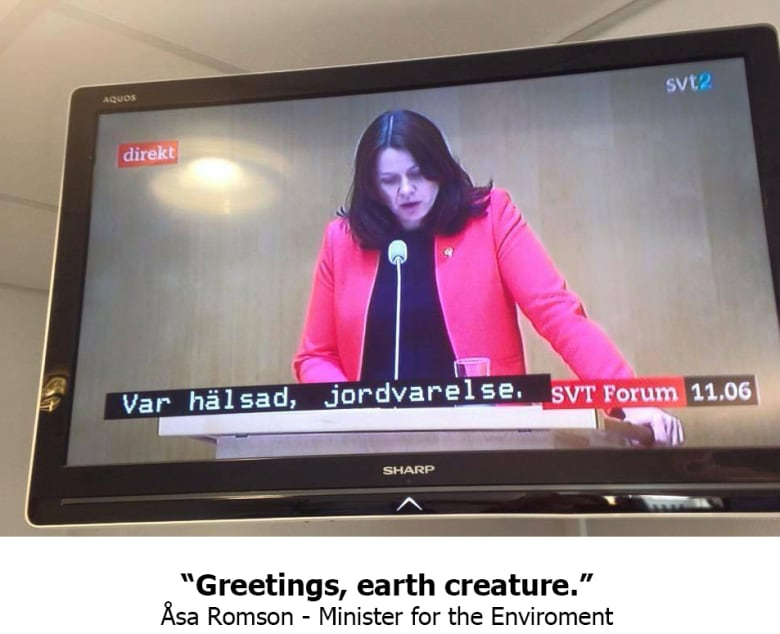 Although it's unlikely that Swedish politicians begin every announcement with that greeting. And another on investment in innovation. The minister for the environment makes an analogy for what is likely an important political issue. She then looks for insight from the public. 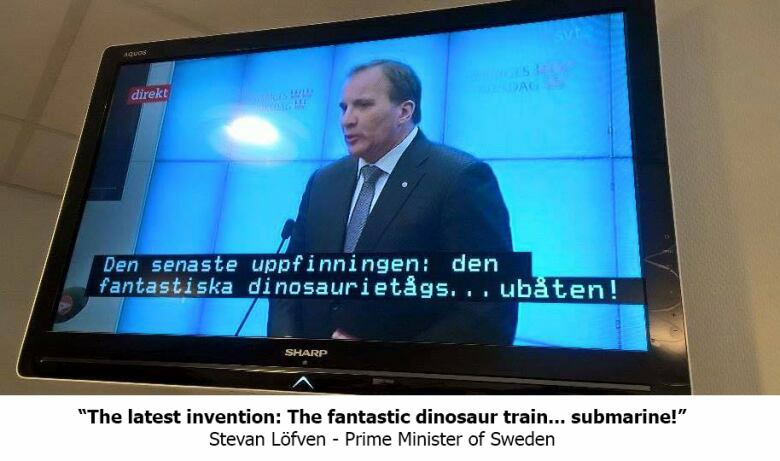 Another Imgur user pointed out that the closed captions were probably sourced from an education programme called Dinosaur Train. In Canada, the show plays on TVOKids. At least some of the lines in the closed captioning correspond with an episode called "Submarine Adventure." 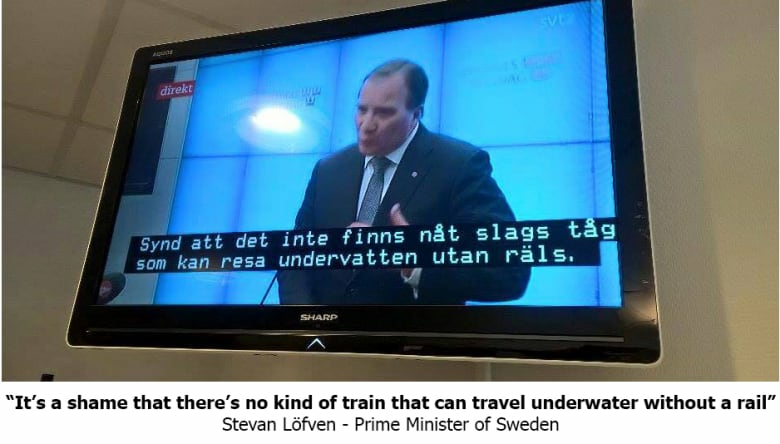 In this preview for that episode, a dinosaur declares how great his underwater train is, much like the Prime Minster of Sweden appears to have. As for how this happened, it might have been a problem with TheBlondeSwede's TV and not SVT, Sweden's public broadcaster. "On some older TVs can still choose the old teletext page for the different channels' subtitles, while checking on a different channel," SVT's Undertexts manager, Anna Zetterson, said in Swedish on its Facebook page. "So SVT, or any operator, didn't send these out. But it is something you can amuse yourself with on an older television set." As a result images like these, where the visuals are mismatched with the subtitles, has happened quite a few times before. "It has gone viral several times and it may look funny," Catarina Wilson, a spokeswoman for SVT, told the Australian Associated Press. Whatever the cause, remember the next time you watch CPAC that it could be so much better.